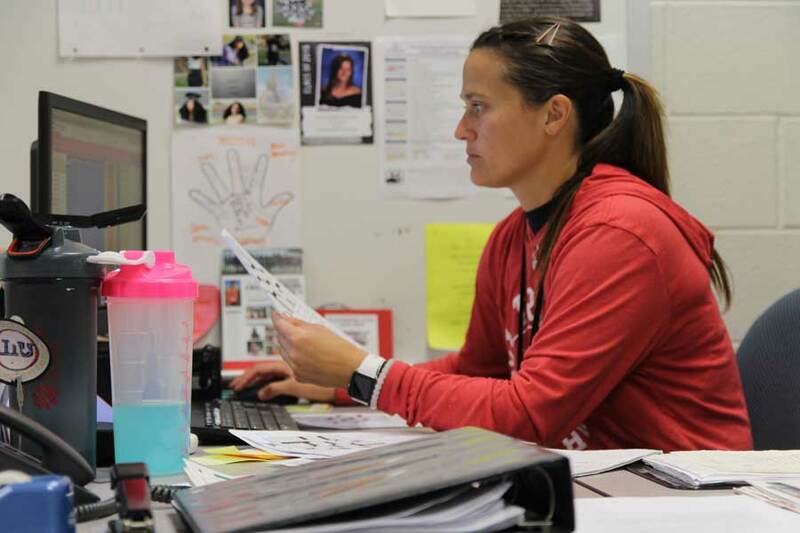 Coach Lacy Beckler works at her desk during her off period. Beckler works a second job to earn extra money. Chemistry teacher Mr. John Sudbury walks into his second classroom to teach a handful of students. Drained and tired after an eight-hour day at school, he starts to teach driver’s ed, his second job. Sudbury, as well as 18 percent of teachers in the United States, works a second job for income. These teachers emphasize the importance of time management because of their busy schedule. Mr. Sudbury works at Mansfield Driving Academy as a driving instructor. He helps with drive time and also teaches in the classroom. “The hours are pretty flexible, and I can choose how much or little I need to work depending on what other activities I have going on,” Mr. Sudbury said. Not only does Mr. Sudbury need to make time to teach the driver’s ed, but he also needs to grade papers, make new lesson plans and have parent-teacher conferences. He focuses on parenting his two sons as well. “I have had to become a master at time management. I have to find balance with working two jobs and being a husband and a father to two boys as well,” he said. For some teachers, salary raises don’t cover the whole cost of the phone bill, health insurance, medical bills, etc. Therefore, they have to find more than one job to provide for the family. The average teacher in the United States makes about $58,950. The average teacher in MISD makes about $54,324 per year. Energy bills alone cost $2,200 yearly. “In my opinion, the biggest struggle for myself, and maybe many teachers too isn’t the salary, but it is that the salary increases don’t really keep up with the cost of inflation, or how much things cost,” Mr. Sudbury said. Coach Lacy Beckler, cross country coach, social studies teacher and PE teacher, also has two jobs to bring in her income. She works her second job as a level one CrossFit trainer at CrossFit Boom in Kennedale. The expectation to help people at both jobs causes stress. “You can’t just show up to either of my jobs unprepared or ready to sit behind a desk not socializing. Both are very interactive and planning is necessary for my best performance,” Beckler said. Two jobs adds stress to teachers and exhausts them. In a typical week Beckler works in the evenings Monday through Thursday, some Saturdays and every Sunday. “It takes a lot of my personal time, but I don’t notice it that much because a lot of my friends are at my second job and it has always been a huge passion of mine so it does not feel like work,” Beckler said. Although the extra job can bring stress it also benefits them in different ways. Teachers use the extra money to take trips, buy themselves new things and pay off bills. “This can be taxing and sometimes it seems as if I am always pouring-off bills out to others without much pouring back in, but that doesn’t really affect me much because I love serving people and trying to help them become better versions of themselves,” Beckler said.